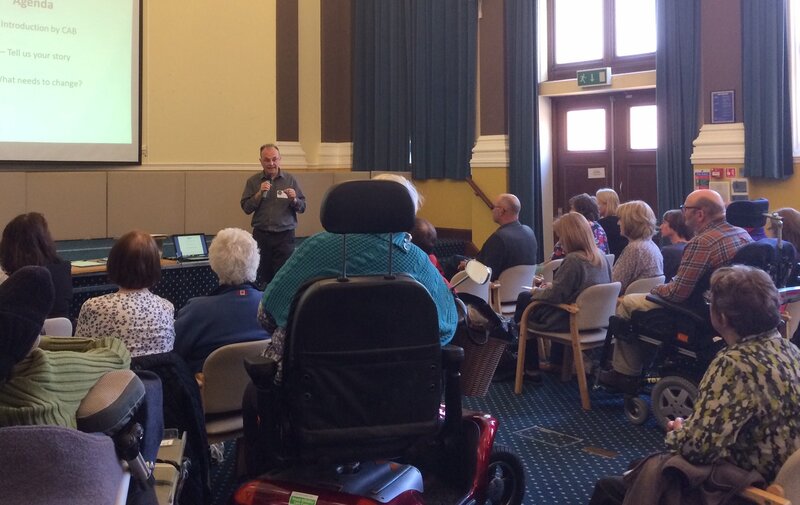 Citizens Advice Eastbourne held a public event to discuss the impact of changes to the disability benefits system. Problems for people claiming Personal Independence Payments (PIP) and Employment and Support Allowance (ESA) have been the biggest subject the Bureau has dealt with in the past year with a 12% increase in PIP enquiries compared to the previous year. At the event, which was held at the Town Hall, people shared their stories, detailing the problems they had experienced when trying to apply for benefits or when being switched from Disability Living Allowance to PIP which had required them to make a new application. Many people told of financial hardship and increased stress which impacted on their mental health. Motability vehicles, essential for people to be mobile, had been lost when disability benefits were turned down, leaving some people housebound. “We have written back to the DWP and asked them for a Mandatory Reconsideration to look at the decision again. To date we have not had an answer”. The assessments need to be fair and the individual’s circumstances listened to. Assessors need to be properly trained and have understanding of the conditions the claimant has. Citizens Advice Eastbourne will use the evidence collected as part of a campaign to make the benefit system fairer for everyone.